While the ongoing decline in the implicit rental cost for owner-occupied housing was weighing on core inflation, a number of participants observed that the moderation in price changes was widespread across many categories of spending. This moderation was evident in the appreciable slowing of inflation measures such as trimmed means and medians, which exclude the most extreme price movements in each period. A few weeks ago, Laurel Graefe posted a nearly identical sentiment in this blog using data from the January consumer price index (CPI). Their chart is reproduced here for two reasons. First, I’m a sucker for a cool chart, and this one certainly qualifies. But this chart has the added benefit of being very informative. The size of the circles represents the weight of the items in the consumers’ market basket. Circles under the dashed 45 degree line represent goods or services in the market basket that have shown less price pressure in the past 18 months than during the prior three and a half years. Note that the cost of housing is one of the goods under the 45 degree line. But the authors’ point is that most of the consumers’ market basket is under this line—a pretty clear sign that the disinflation we have been seeing extends well beyond the cost of housing. At the risk of piling on, I’d like to add yet another chart to the mix. In the ordinary course of business, at the Atlanta Fed we compute diffusion indexes for the CPI on both a weighted and unweighted basis. A diffusion index is designed to gauge the breadth of change in some aggregate statistic (though it is silent about the magnitude of that change). 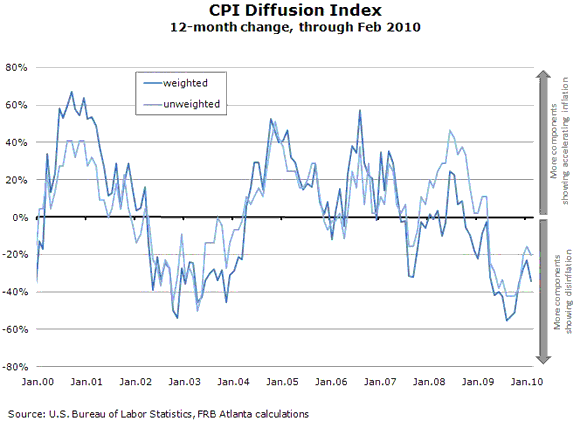 The diffusion index below is the 12-month diffusion index for the CPI. Specifically, it shows the proportion of the CPI market basket that rose more (+) or less (–) during the past 12 months than during the prior 12 months. So diffusion index values below zero indicate that the majority of the CPI is rising less rapidly than a year ago while values above zero indicate the opposite. On both a weighted and unweighted basis, the CPI 12-month diffusion index is below zero—and has been since last April. Conclusion? It’s not just the housing sector that is driving the recent disinflation trend. On a concluding note, we’d like to call your attention to a new Web page, The Inflation Project, that is intended to be a repository of information about inflation—from news reports to recent research. We find these reports useful in our daily work and thought you might find them informative as well. Housing Affordability Index Largest Monthly Drop in Four Years; Market Reached Bottom?